Game Troopers has announced the release of its latest game Runemals today. Runemals is described as a game that combines puzzle mechanics with classic turn-based RPG fun and monster-collecting, so if you’re a fan of the Pokemon games, you’ll probably find something to love about the familiar gameplay mechanics in Runemals. Gather energy by tapping color groups in super-fast 10-second challenges. Lead your team in battle, decide your strategy and manage your energy resources. Explore an island full of adventures, defeat powerful enemies and acquire the loot. Discover, CAPTURE and train a vast collection of unique animals. Test different team combinations, try different elemental creatures and discover which ones are more versatile, more powerful or suit your gameplay the most. Level your team up so they learn NEW abilities. 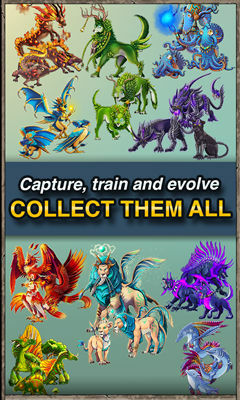 EVOLVE them to make them even stronger: with the right training, charming creatures can become awesome battle beasts. Discover Bright’s adventure: an orphan who will become a Runemal trainer thanks to his master’s help. Runemals is set in a huge world constantly expanding with regular events, special quests, new creatures and updates. Lead your team in battle, decide your strategy and manage your energy resources. Explore an island full of adventures, defeat powerful enemies and acquire the loot. Runemals is available for free. Unfortunately, it’s not part of the universal Windows 10 platform so you can only find it on mobile devices at the moment. It does, however, contain support for low-end 512MB devices.